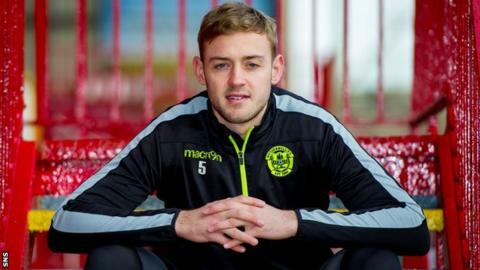 Louis Laing got so frustrated during his absence from the Motherwell first team that the former England youth defender considered quitting football. The 22-year-old only made two starts in five months after losing his place in the team shortly before the departure of Ian Baraclough as manager. "It's the worst thing in the world as a professional when you're not playing on a Saturday," he said. "And there's times where I've thought 'I'm going to hang the boots up'." However, he has returned to the team for the past three games. "I've came through that period hopefully, I'm feeling confident in myself, but the main thing is getting wins for Motherwell," he said. Laing, who signed a two-year contract in the summer, found himself behind Kieran Kennedy and then Ben Hall in the race to partner Stephen McManus in central defence. He started Mark McGhee's first match in charge, a 1-0 defeat by Celtic in October, but his only other start came in a 3-0 loss at Ross County before his surprise recall at Tannadice last month. "It's a hard 10 or 12 weeks where I wasn't in the team, at times not even being on the bench, so it was a frustrating time," he said. "But the change of formation fell to my fortune against Dundee United, when we played three at the back, and since then I've stayed in the team for the last three games, so hopefully I can keep impressing the manager and stay in the team for the rest of the season. "Me and the manager have had quite a lot of talks, he's advising us what he wants us to do, and what I need to be doing. I suppose, at the end of the day, it comes down to myself and a lot of confidence." McGhee initially saw the potential to convert Laing to a holding midfielder, but he returned to the team as one of three centre-backs before lining up at right-back during last weekend's win over Partick Thistle. "It's quite a fortunate thing to be able to play in a few different positions," Laing said. "I'm not sure where the manager sees my best position, but as long as I'm on the pitch I don't really mind where I'm put. I'll play in goal if I have to."